A weekly progress report as I work through the (second pass) editing of my current fantasy novel. I really thought I was going to have nothing good to report this time, but I wound up squeezing out 13 pages despite it being New Year's and a bunch of other things coming up. It was, however, a welcome if unscheduled break which hopefully has charged my batteries a bit. So, 13 pages, bringing me to a current page of 151 (up from last week's 140). 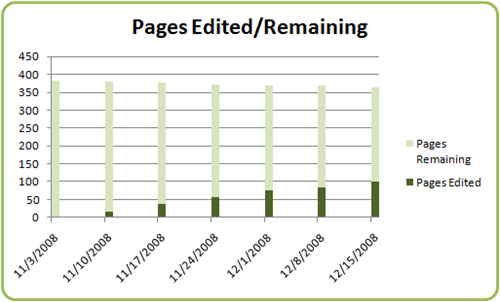 Total pages went down, again, this time from 354 to 352. 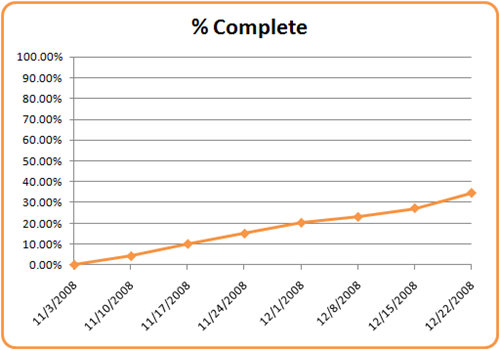 % complete went from 39.55% to 42.90%. A small gain. Total word count: last week I had 104,006 words. 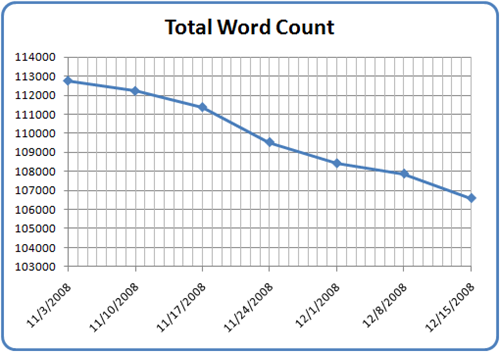 This week, 103,397, a decrease of 609 words. Not much of a decrease, but a decrease nonetheless. That's it for this time. Back to writing for me. Another good week. Before I jump into the numbers, some reflection: I find myself cutting a lot of "junk". By that I mean passages that are nothing more than info dumps or scenes where a character is thinking, introspectively, mayhap trying to rationalize something out, but I'm finding those paragraphs kind of tedious to read. I can only assume if I find them so, how's a reader going to feel? That's an excellent warning sign of something that probably needs to go. In fact, if you take nothing else from this post, take that. If you find yourself losing interest while reading your own writing, chances are your readers are going to feel the same way. No point in keeping such baggage around. Like I started to say: it was a good week, especially considering half of it was spent at various xmas functions. 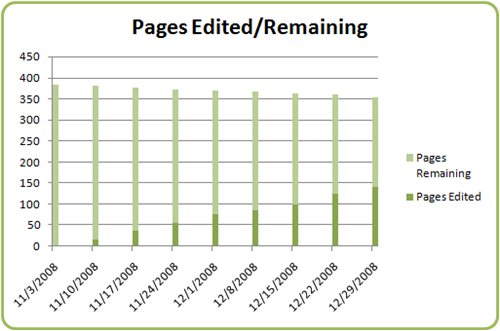 Overall, I advanced my current page editing to 140, up from last week's 125. Total pages dropped (again) from 361 to 354. That gave me 22 pages for the week. 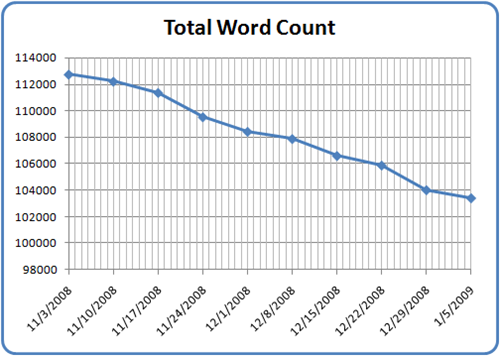 Total word count proved interesting once more, decreasing by 1,864 to a total of 104,006. It's amazing how much that keeps going down as I cut and slash and tighten my prose. It will be interesting indeed to see where it lands when all is said and done. That's it for now. Back to writing for me. This was a good week. Much better than last, anyway. 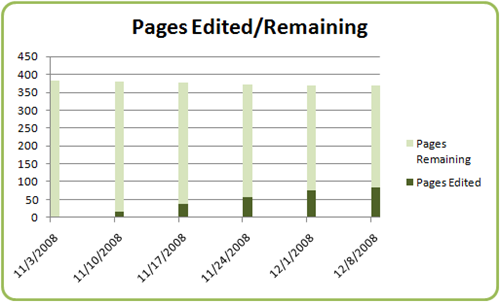 I managed to edit through 28 pages total, only 2 of which came from page reduction. 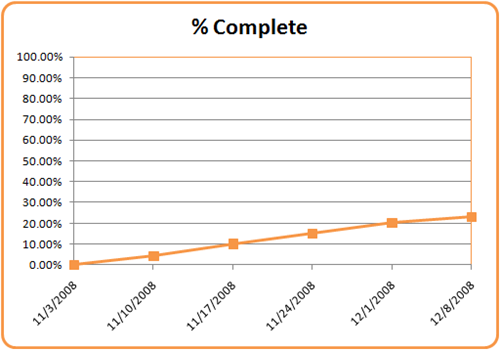 That puts me at a current page of 125, up from last week's 99, out of 361 pages total, down from last week's 363. 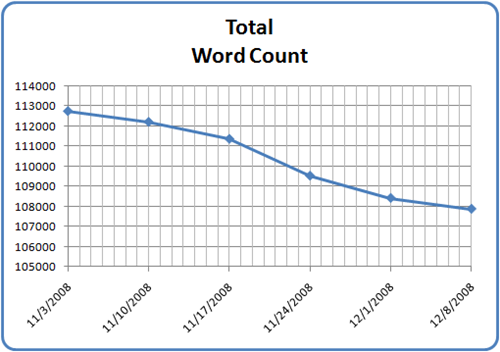 So, I dropped about 700 words, which more or less continues my downward trend as shown directly above. 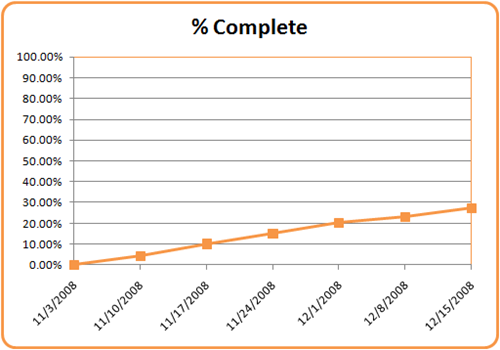 Still, I only reduced the total page count by 2 this time; most of the progress came from pushing forward. I've been shooting for roughly 20 pages/week. From a full-time writer's perspective that probably isn't very good, but I don't think that's a fair outlook on things. You have to look at it from the perspective of someone who does this in his spare time after going to work every day. Anyway, the moral of this story is to write, however and whenever you can. Hope to have some good progress to report next week as well. I've got one more day at work, then I'm off the remainder of the year, so I sure hope I'm able to make good use of the time. A weekly progress report as I work through the editing of my current fantasy novel. This one is out a day late only because we lost Internet access last night due to some icy weather and, as I type this, it still hasn't come back on. (Update: It just back on a little while ago, so about 24 hours w/out connectivity.) "Frozen junction boxes" they tell me. In any case, here's this week's writing update. Overall, I'm up 19 pages for the week. Not quite the 20 pages I like to get, but close enough. 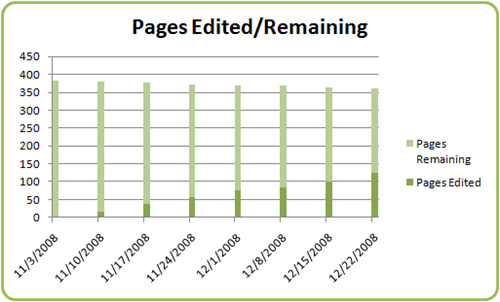 14 of those came from forward progress, 5 from a reduction in page count. It's all part of the editing process. 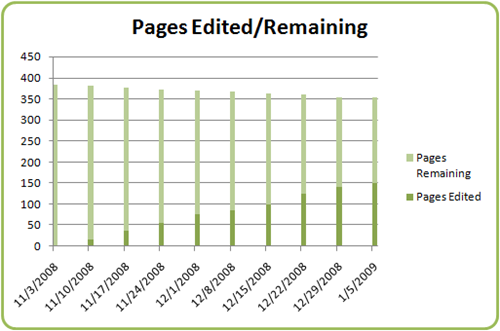 That puts me at a total page count of 363 (down from last week's 368) and a current page of 99 (up from last week's 85). I'm well below the 110,000 words I wanted to get under at this point. Even with the additional material I plan to add back in (to give one character in particular a bit more of the story) I don't think I'll go much over that word count. 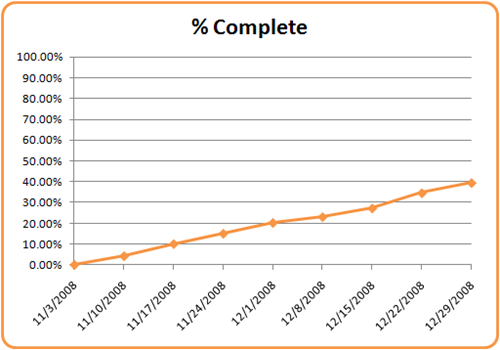 Also, if this trend continues, I might even approach 100,000 words by the time I'm done. I kind of hope not. Originally, this novel stood at 135,000 words. I can't help but feel I wasted a lot of time chugging out that 20,000 or so words only to have it cut. I think about 5-6,000 of that reduction came about simply because I chopped out one whole character from the narrative. But the rest was plain and simple editing: killing darlings and tightening up the prose. I suppose it's an inevitable part of the writing process. You can plan, but you can't plan every word, sentence, or paragraph. This was not the best writing week for me (I could bore you with tales of Christmas parties, shopping for mountain bikes, and other stuff, but I won't). Still, I pulled off 12 pages, so not awful. Just not that good. I certainly did not meet my minimum goal of 20 pages or 5%. I think, however, that this week will be better. It's good to report progress regardless of the progress itself, at least for me. It shows me where I'm at, and where I need to improve. Best of all, it's an excellent indicator of whether or not I'm staying on target. This past week I got a little off target, so I'll need to double my efforts and make sure I make my goal for this upcoming week. Overall, I'm on page 85 out of 368. I'm 23.1% complete, up about 3% from last week. 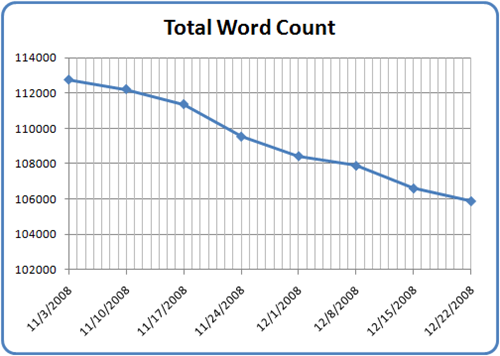 Word count stands at 107,872, down from last week's 108,415. You can really see a smoothing of the graph in recent weeks. This is not to say that it won't have another dramatic drop (or rise), but lately the word count has hit a plateau of sorts. It will be interesting to continue watching this as I get further along.